Skill in the traditional board game Go is measured by a number of different national, regional and online ranking and rating systems. Traditionally, go rankings have been measured using a system of dan and kyu ranks. Especially in amateur play, these ranks facilitate the handicapping system, with a difference of one rank roughly corresponding to one free move at the beginning of the game. With the ready availability of calculators and computers, rating systems have been introduced. In such systems, a rating is rigorously calculated on the basis of game results. Traditionally, the level of players has been defined using kyu and dan ranks. Kyu ranks are considered student ranks. Dan ranks are considered master ranks. Beginners who have just learned the rules of the game are usually around 30th kyu. As they progress, they advance numerically downwards through the kyu grades. The best kyu grade attainable is therefore 1st kyu. If players progress beyond 1st kyu, they will receive the rank of 1st dan, and from thereon will move numerically upwards through the dan ranks. In martial arts which adopted kyu and dan rank system from Go, 1st dan is the equivalent of a black belt. The very best players may achieve a professional dan rank. Although almost all organizations use this system, there is no universal calibration. The means of awarding each of those ranks and the corresponding levels of strength vary from country to country and among online go servers. This means that a player who is considered to be a 2nd kyu in one country may only be considered a 5th kyu in another. The first Go ranks were given in 2nd century China, when Handan Chun (Chinese: 邯郸淳) described the 9 Pin Zhi (九品制) ranking system in his book Classic of Arts (艺经). From the early 17th century, the Japanese formalised the teaching and ranking of Go. The system was later used in martial arts schools, and is thought to derive ultimately from court ranks in China. It is thought that there are 9 professional dan grades because of the original 9 Chinese Pin Zhi grades. The difference between two amateur grades is based on the number of handicap stones that a player requires to even the odds against a stronger player. A 5th kyu player will generally need a 3 stone handicap when playing against a 2nd kyu player to give both players a fair chance of winning. Similarly, a 3rd dan player will need a 2 stone handicap against a 5th dan opponent. Dan (abbreviated online as "d") ranks are for advanced amateur players. Although many organisations let players choose their own kyu rank to a certain extent, dan ranks are often regulated. This means that players will have to show good results in tournaments or pass exams to be awarded a dan rank. Serious students of the game often strive to attain dan ranks, much as martial-arts practitioners strive to achieve black belts. For amateurs, ranks up to 7th dan are available. Above this level, a player must become a professional player to achieve further promotions. In Japan and China, some players are awarded an amateur 8th dan rank as an honorary title for exceptional achievement. In the United States, amateur dan ranks are capped at 7 dan, although some professionals and strong amateurs have achieved the equivalent of 8 or 9 dan on the AGA's rating system. Similarly, some players have achieved 9th-dan amateur ranks in the rating system of online-go servers. Although players who have achieved professional dan ranks are nominally stronger than amateur dan players, in practice, some of the strongest 7th dan amateur players have a playing level on par with that of some professional players. Such players have either never tried for a professional rank, or have chosen to remain amateur players because they do not want to make a career out of playing Go. A very small percentage of the strongest players are eligible and achieve professional status, a distinction awarded under strict conditions by the professional go associations of Japan, China, Korea and Taiwan (and, most recently, in the United States and Canada and the EU). Professional players use a dan ranking system similar to that of amateurs, with dan ranks that increase numerically with skill. The difference between these grades is much smaller than with amateurs however, and is not based on the number of handicap stones required. Professional dan ranks range from 1st dan to 9th dan, but the strength difference between individual professionals is generally never more than 2 or 3 handicap stones. The rank represents a lifetime achievement, and is never lost, so players of 9th dan rank need not be among the strongest professional players anymore. To distinguish between professional dan and amateur dan ranks, the former is often abbreviated to "p" and the latter to "d". There was no such abbreviation in the past, and this is not generally used as an abbreviation beyond the Internet, where it is common, but not universal. With the invention of calculators and computers, it has become easy to calculate a rating for players based on the results of their games. Commonly used rating systems include the Elo and the Glicko. Rating systems generally predict that one player will defeat another player and will use this prediction to rank a player's strength. 2700 7 dan amateur or 1 dan professional. a is varied depending on the prior rating of player A. In the EGF system, points won by the winner almost equal the ones lost by the loser and the maximum points movement is the constant K (from above). However, there is a slight inflationary mechanism built into the ratings adjustment after each game to compensate for the fact that newcomers usually bring fewer points into the pool than they take out with them when they cease active play. Other Elo-flavor ratings such as the AGA, IGS, and DGS systems use maximum likelihood estimation to adjust ratings, so those systems are anchored by prior distributions rather than by attempting to ensure that the gain/loss of ratings is zero sum. The ratings of players are generally measured using the game results of Go competitions and tournaments. Most clubs and countries maintain their own ratings, as do Go playing servers. Go tournaments in Europe use the EGF Official ratings. In a small club, ranks may be decided informally and adjusted manually when players consistently win or lose. In larger clubs or country wide rating systems, a mathematical ranking system is generally easier to maintain. Players can then be promoted or demoted based on their strength as calculated from their wins and losses. Most Go playing servers use a mathematical rating system to keep track of the playing strength of their members. Such ratings may or may not be translated to kyu and dan ranks for the convenience of the players. Player pools that do not regularly mix (such as different countries, or sub-groups on online servers) often result in divergent playing strengths compared to the same nominal rank level of other groups. Players asked to give their rank will therefore often qualify it with "in my country" or "on this Internet server". Note how different the expectations of each system are regarding even games between players of unequal strength. If a player can win 90% of even games against a 2 kyu player, the AGA believes he or she is 1.33 ranks higher, the EGF believes (s)he is 2.42 ranks higher, and the IGS believes (s)he is more than 3 ranks higher. The lack of agreement stems from a tradition of playing handicap games between players of different ranks, so there is a lack of data regarding non-handicap games between mismatched opponents. For even games between players less than one rank apart, it doesn't matter very much which distribution curve is used: roughly accurate ratings will emerge on the basis of many even games. However, because games between unequal players are sometimes played at handicap, some rating systems have a mechanism to incorporate games played with handicap. Generally, they do this by equating the handicap stones to a certain number of rating points. These points are then added to the rating of weaker player for purpose of calculating the rating change of the stronger player, and are conversely deducted from the rating of the stronger player for purposes of calculating the rating change of the weaker player. 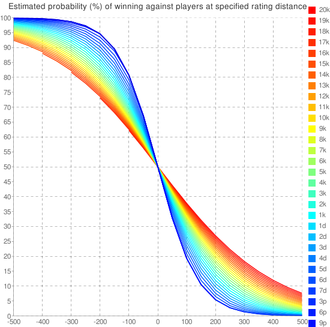 This mechanism has the effect of calibrating the rating-based ranks to be a stone of handicap apart, which is in conflict with ranks being a certain winning percentage apart. In chess you must take some risks to avoid a draw, but the komi system in modern go has rendered draws extremely rare. Draws stem from an institution's ruling on unusual game occurrences, such as Article 12 of the Japanese rules regarding repeating positions; or a tournament's use of integer komi. Also, an average game of Go lasts for 240 moves, compared to 80 in chess, so there are more opportunities for a weaker player to make sub-optimal moves. The ability to transform a small advantage into a win increases with playing strength. Due to this ability, stronger players are more consistent in their results against weaker players and will generally score a higher percentage of wins against opponents at the same rank distance.